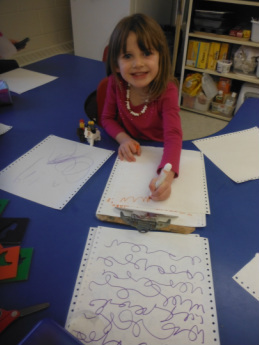 Nursery School Program - Souris Cooperative Early Learning Programs Inc.
Our Nursery School program offers a well-planned, play-based curriculum with a focus on literacy and school readiness. Mrs. Jacquie Friesen, ECE II, is the current Nursery School teacher at Souris Cooperative Early Learning Program. Souris Cooperative Early Learning Program, Nursery School program is committed to providing secure physical, emotional, and intellectual environment for children 3 to 5 years old. We believe that children learn by exploring and experimenting through play, therefore we aim to provide an environment in which the children are exposed to a variety of experiences that enhance their total development, and encourage independence. The structure of the program we provide is flexible, yet organized and consistent. There are quiet play areas, noisy play areas, sitting areas, work stations, and areas for imaginative expression. Within these alternatives the child may choose his activity. The staff, to the best of their ability, moves with the children to the area and activity they choose. The child sets his own direction and can explore it as deeply as he wants, while the staff provides materials, skills and support. In such an environment and with consistent relationships with loving caregivers, we believe that a child will gain school-readiness skills and develop to his individual maximum level, thus assisting to prepare each child with school readiness skills. We believe the nursery school experience is the building block for all later learning- Everything a child learns lays a foundation for concepts they will be presented with later in life. Children are encouraged to learn through activities that are appropriate to their age and individual stages of development. Kids can usually choose among several activities and can play alone or in small groups, while the whole group often comes together for songs, stories, or other “circle time” activities. Today, Kindergartens have become more academic and less just an introduction to the classroom. As a result, our nursery school will take steps to prepare children for school by integrating a more structured schedule for pre kindergarten children. The mission of The Souris Nursery School is to foster the physical, social, emotional, language and cognitive growth of each child, helping to foster a love of learning and independence in children ages three to five years. Souris Cooperative Early Learning Program is dedicated to the Developmental/Academic philosophy and method of education through the senses and play. Children will develop inner discipline and gain the ability for later complex reasoning through the free choice and organized use of materials. Children may choose work and experiment with materials from our curriculum. Children will receive a well-rounded educational experience which supports their physical, language and cognitive development through participation in art, science, language, math, geography, history, practical life activities, music, dance and movement. We have integrated role playing areas into our classroom through dramatic play, blocks, books and manipulatives to further help develop social and emotional development. In the classroom: The teacher’s role in the classroom of Souris Nursery School is to extend the children’s thinking, support their learning and physical, social, emotional, language and cognitive development. This learning occurs by making observations, skillfully asking questions, offering suggestions and providing materials and activities that will extend children’s play and provide learning opportunities. To the parents: The teacher will communicate with the parents/caregivers to provide information about their own child’s daily activities, interests and progress. Progress meetings will occur before the Christmas break (December 19th to 22nd 2011) and before Spring break (March 19th to 22nd 2011). In the community: The teacher will plan field trips to various places in the town of Souris and work in collaboration with the community to provide resources, educational opportunities and activities for the children and families of Souris Nursery School. 1. To help children grow in independence and learn self-help skills. 2. To teach children how to respectfully give, share as well as receive attention. 3. To help children learn how to get along with others, develop a positive self-image, and build self-discipline skills. 4. To encourage individual development and enhance school readiness skills. 5. To provide opportunities for children to have hands-on exploration, learning and understanding of the physical world. 6. To establish a strong partnership between children, parents, community, and the Nursery School to ensure optimal learning is provided to each child on an individual basis. To request more information about the Nursery School Program at Souris Cooperative Early Learning Programs please fill out the form below.